Over 200 people thronged the Nkwo Orji Market Square in Owerri, Imo State at the one-day ‘Organizing for Urban Justice’ workshop SPACES FOR CHANGE organized on July, 21, 2018. The workshop aimed to create awareness of housing rights within the context of the state’s urban renewal agenda, as well as under national and international laws. 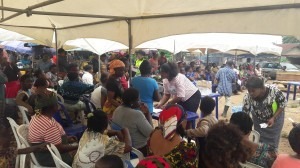 Participants included market women, traders, artisans, farmers and other victims affected by the demolition of the Nkwo Orji Market in March 2018. State authorities demolished the market and promised to rebuild and replace the existing structures with ultra-modern shopping centers befitting of the city’s tourist-friendly status. ‘Today is a special day. This is the first time a human rights organization is coming down here to identify with our struggles for decent trading hubs and secure livelihoods’, the Chairman of Nkwo Orji Market Association, Chief Chidi Anokam stated in a goodwill message. ‘We are grateful to SPACES FOR CHANGE for organizing the workshop and bringing enlightenment to our doorstep. It couldn’t have come at a better time, especially taking into account the market demolitions and the enormous property losses that traders have experienced in the last few months’, the vice chairman of the traders association, added. Executive Director of Spaces for Change, Victoria Ibezim-Ohaeri facilitated the workshop’s first session which focused on the range of local and international laws that espouse property rights and afford legal protection against forced displacement. Some of the laws include the Nigerian Constitution 1999, the Land Use Act, the African Charter on Human and People’s Rights and various state planning regimes. For instance, under Section 43 of the Land Use Act, the state Governor is empowered to remove any building, wall, fence, obstruction, structure or thing which may have been placed on the land in contravention of the Act. But this power is not absolute. The conditions for revocation of title, and due process guarantees shall guide the government’s corrective actions. Put differently, if a landholder has acquired title illegally, the state governor is obligated to follow the identical due process requirements laid down in Section 28 and 44 of the Land Use Act in revoking his title, and consequently ordering evictions. Section 28 relates to the conditions and procedure for revocation of titles on grounds on overriding public interest. Section 44 relates to the procedure for handling contraventions of the Act. The two provisions are however, similarly-worded. They both insist on the following: a well-authorized revocation order, delivery and service of adequate notices, including substituted service on the premises of offenders, and compensation where applicable. Should any dispute or question arise concerning or pertaining to title to any land or interest therein, or in respect of any entitlement of either of the parties to the proceedings, Section 39 of the Land Use Act vests the High Court exclusive original jurisdiction to intervene and make judicial determinations one way or the other. Taken together, sections 28, 43, 44 and 39 of the Land Use Act make clear that the state authority must submit to due process of law before evicting or demolishing any community regardless of whether or not alleged landholders have a certificate of occupancy, customary title, or other form of title. The workshop’s second session, facilitated by S4C’s Legal Officer, Kingsley Ogam-Okafor, focused on the remedial measures that affected traders may employ to seek legal remedies for the violations of their housing and property rights, whether by the government or private actors. When participants were asked if the government served them statutory notices before their shops were demolished, a loud chorus of ‘NOOOO!’ rented the air. A similar reply was recorded when asked if they were paid compensation for losing their buildings and wares during the demolitions. Where proper notices are not served to landlords or tenants or traders as the case maybe, they can legally contest the invalidity of such acquisitions at a high court and seek for a redress against an infringement of their housing rights. 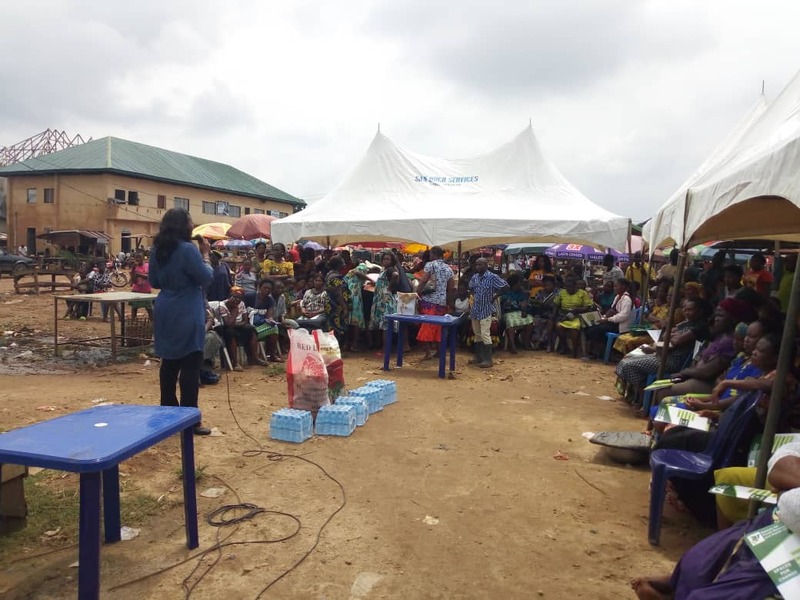 At this point, participants learnt that a case of prima facie infraction to their housing rights had been established and the government could be sued for a gross violation of the housing rights of traders at the Nkwo Orji Market. During the interactive session, it was established that one of the challenges victims of demolitions face is the lack of legal representation, including where to get sound legal advisory services. The high cost of procuring legal services is another factor limiting victims’ access to justice. Non-governmental organizations (NGOs) like Spaces for Change are now filling in this gap for free legal assistance and advisory services to help displaced individuals and groups to assert and claim their social and economic rights, especially in the case of unlawful dispossession of assets. Many of the participants shared that before now, they were unaware of their rights, especially the legal right to sue, seek redress in court or demand compensation from the government. When S4C asked about life after demolitions, a lot of them expressed that their finances have dwindled following their losses. Most of them have been caught up in difficult times ever since they lost their shops, wares and other sources of livelihood. Women stated that they now have to commute long distances with their wares to the market on a daily basis. Before, they used to store their wares in the market in lock-up stalls, but now, they have to carry them to and fro, with many items perishing in the process. ‘There is a limit to what one can carry to market everyday’, a participant lamented. Chief Chidi Anokam, the Chairman of Nkwo Orji Market Association appealed to SPACES FOR CHANGE to assist the traders, particularly women with soft loans for trading. He also urged S4C to assist them in pressuring the government to compensate or resettle the traders in the same market when it is rebuilt. SPACES FOR CHANGE responded to all the questions and concerns expressed by the traders and encouraged them to reach out to the organization for further assistance and engagements. SPACES FOR CHANGE is committed to providing legal advisory support and representation to rural and urban communities affected by urban renewal programmes. Through its many intervention programs, it has improved the public’ awareness of their rights and roles as citizens.